After playing schedule tag for several weeks, Erin and I were finally able to find time in our crazy busy schedules for me to take her out for belated dinner to celebrate her birthday that just passed. Oh, and fun fact: our birthdays are a day apart! Since we had to scrap our original plans of having fondue at The Melting Pot in Jersey, I had to think of somewhere in the city for us to go. Then I remembered an old co-worker of mine, JB, had raved on and on about the pastas at Scarpetta, landing a spot on my list for a while now. What really sent me over the edge was when I was perusing the Restaurant Finder on Immaculate Infatuation to find that they had rated Scarpetta very high (an 8.6! 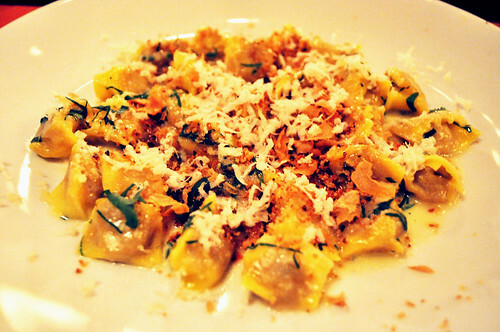 ), plus one of the items that they had sampled (and fell in love with) was the duck and foie gras ravioli. This one dish was the clincher. It was settled -- Scarpetta was to be the place. 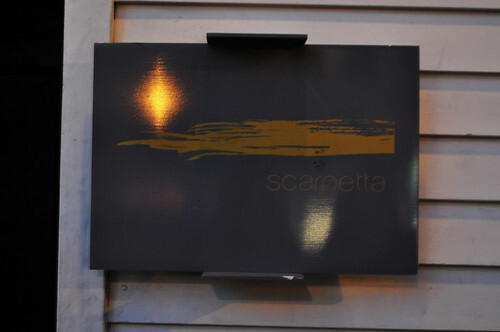 The mastermind behind the kitchen at Scarpetta is Chef Scott Conant, a graduate from the Culinary Institute of America. After studying pastry in Munich, Chef Conant returned to New York City as sous chef at San Domenico. He later went on to be the chef de cuisine at Il Toscanaccio in 1995 and helped revamp the restaurants Barolo and Chianti. He also took the chance to open a new restaurant, City Eatery, as executive chef, showcasing "his modern take on Italian cuisine." 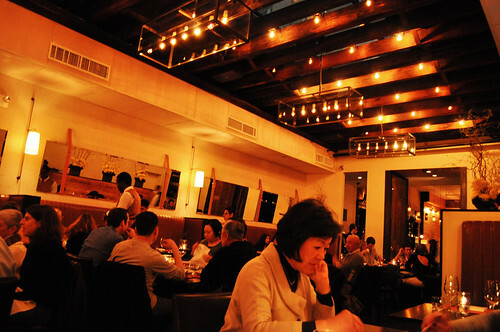 In 2001, Chef Conant was approached about opening a restaurant in Tudor City. So in preparation, he traveled to Italy to work with some of the country's most celebrated chefs and reconnected with his distant relatives in Beneveto. A year later, L'Impero was opened, with a menu that "seamlessly fused the classic dishes of Chef Conant's childhood with his own interpretations of Italian cuisine." The following year, L'Impero garnered much acclaim in the culinary world, including "Best New Restaurant" in the U.S. from the James Beard Foundation in 2003. Chef Conant went on to open Alto, a restaurant whose focus laid in his interpretation of Northern Italian cuisine. A few years later, he made a huge decision to leave L'Impero and Alto to open a restaurant that would be "100% his own creation." And accordingly, Scarpetta was born. Italian for "little shoe" (or the shape that bread takes when used to soak up a dish), Scarpetta "represents the pure pleasure of savoring a meal down to the very last taste" with food that is "unexpected and soulful." Scarpetta's interior design is intended to reflect Chef Conant's "earthy yet modern approach to Italian cuisine" located in a Greek revival townhouse over in the Meatpacking District. It is both rustic yet has contemporary touches in for good measure. 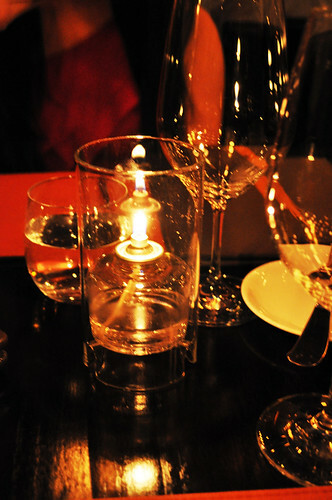 On the table at Scarpetta -- love these miniature liquid candle lamps! Makes it a little different from the usual tea lights. 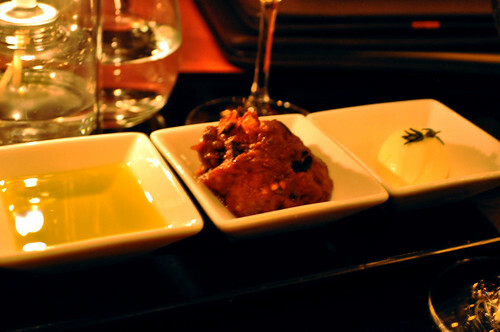 Some spreads for our bread -- extra virgin olive oil, olive tapenade, and mascarpone butter -- all lovely! 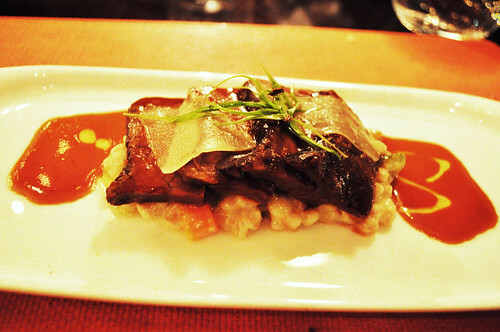 Erin's first course was the braised short ribs of beef with vegetable and farro risotto. The short ribs were braised to an incredibly tender softness coated in earthy and juicy flavors. The vegetable and farro risotto was lightly creamy, plus I'm a total sucker for highly textured grains (barley, brown rice, freekeh, etc.). It was the ideal ratio between meat and carbohydrates. Very well done. It is definitely on the spectrum as a heavier starter, so if you're having a heavier main course later, perhaps I would go with something lighter. 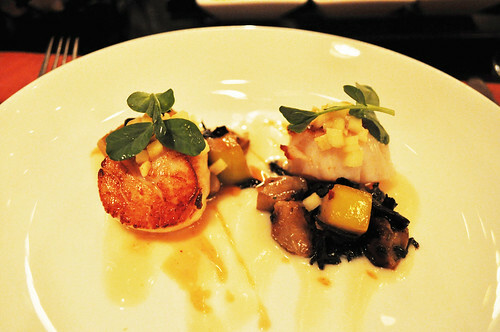 To start, I had the seared sea scallops with sunchoke, apple, and black trumpet mushrooms. They were nicely seared at an enjoyable temperature (not too raw, not totally overcooked). The medley of sunchoke (i.e., sunflower tuber), apple, and mushrooms gave an otherwise summery bivalve a wintry and heartier embellishment. 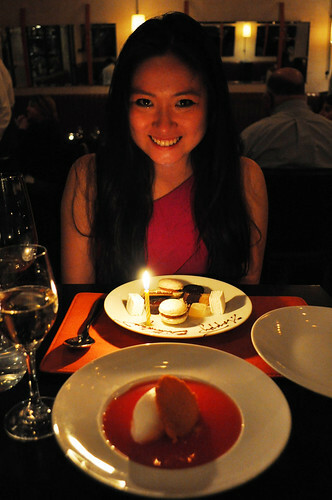 Overall, the seared scallops were pretty good, but if I end up back at Scarpetta, I would opt to try something else. 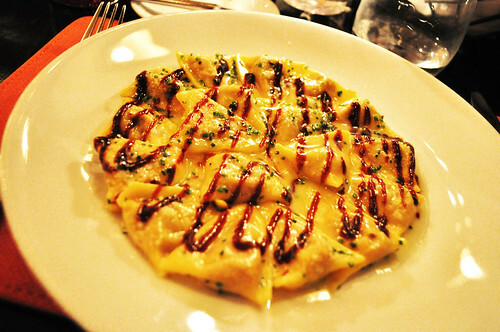 One of Erin's favorite foods is foie gras, so I insisted that the birthday girl order the duck and foie gras ravioli with marsala reduction (with permission from her to steal some bites, of course). The zig-zaggedy sauce was the marsala reduction. This is as decadent as you can get with pasta, without heavily piling on freshly shaved truffles (black or white). So very rich and absolutely delicious after every single bite of these delicate pillows of flavor as each collapses right onto your palate. Even with the hefty price tag of $26 a plate of these beauts, it is worth every single penny. I please you to order this. It is not a suggestion -- it's an order! Alternatively, to add some variety to our menu choices that evening, I had the short rib and bone marrow agnolotti with garlic chips and fresh horseradish. Thought not equally as indulgent as the duck and foie gras ravioli, this is still pretty up there. Braised short rib meat lightly cloaked by the essence of bone marrow -- a combination of fatty yet silky -- filled these pasta packets, waiting to share its rich news with its audience. The garlic chips gave a refined crunch, providing a textural contrast to the soft cushions and tender meat inside. I was concerned that the fresh horseradish would be too pungent (even the mildest of mustards haunts me), but by the time this dish arrived at our table, I forgot there was even horseradish! So if you're looking for a different kind of pasta than the token dishes (bolognese, clam sauce, alfredo, etc.) but not so much as to venture out to have foie gras, then this will be the right choice! 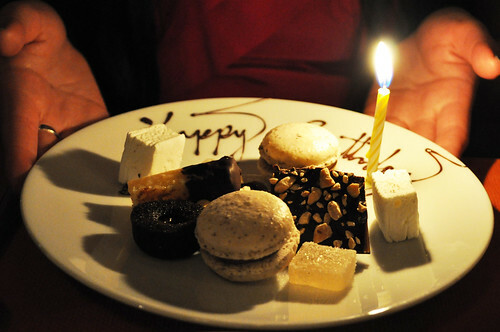 I let the maître d' know ahead of time that we'd be out celebrating Erin's birthday, so when it came time for dessert, the kitchen arranged a little plate of mignardises (macarons, pâtes de fruits, chocolate brittle, etc.) with a candle and "Happy Birthday" written in chocolate. In addition to the mignardises, we both opted to share the coconut panna cotta with guava sauce and caramelized pineapple. For such a tropical-themed dessert (Hawaiian, even), I was quite wary of how this could be executed well at an Italian dining establishment, even if the dessert's base was a staple of Italian sweets. I was so relieved to be wrong! Did I ever tell you how much I love guava fruits? Well, I really, really do. When I was in Hawaii two summers ago visiting a friend from university, I took in all the guava I could find (juice, smoothies, what have you) because I've had a difficult time finding fresh guava over on the East Coast. It was so refreshing and awesome to taste that tangy fruit once again. The guava sauce complemented the coconut panna cotta extremely well and some playful bites of cubed caramelized pineapple. Like a refreshing piece of fruit you enjoy after a heavily delectable meal, this was the most excellent way to conclude it, alongside a glass of gently chilled moscato d'Asti. 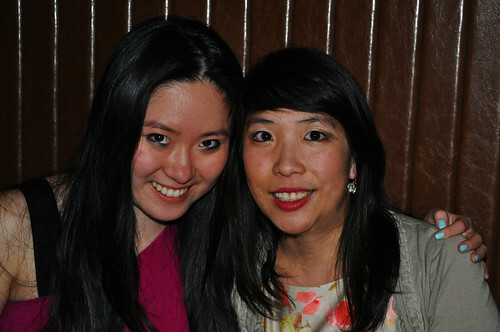 Erin and me at Scarpetta. Immaculate Infatuation's "Friday Fives" Q&A with Michelle Trachtenberg. Don't worry -- it's on my list for next time! Something I find most fascinating when I'm dining out are the stories behind a restaurant's moniker, and not just the ones where its address dictate its name (among my favorites: Alinea, Jewel Bako, Recette, and Il Pittore). Scarpetta is now on that list -- everything we ate that night had the feeling that the Italian word, scarpetta (the shape that bread takes when used to soak up a dish), so perfectly expressed: you will undoubtedly experience that "pure pleasure of savoring a meal down to the very last taste." Price point: $18-19 for each primi, $25-26 for each paste, $11 for each dolce, $12 for each glass of moscato d'Asti. it was so yum <3 thank you for such a lovely night :) love you bestie! One of my favorite places to go without an advanced reservation (the tables out front). But you didn't even try two of their most popular items, the truffle polenta and the spaghetti with tomato and basil. They're so good! You have to go back! Haha yes -- I'm hoping to go back really soon. I'm dying to try those two items -- there was just so many things I wanted to order -- couldn't do it with just two guests! Thanks for the tips -- hope you're doing well!